My partner Alice Simons-Denville and I, were set the task of creating a web video. The only aim for the footage was to not be structured in a typical news package style.We opted to a ‘creature comforts‘ style of documentary, where we recorded informal interviews with people about branding and their thoughts. It might seem a little rough around the edges but it was probably made in about 24 hours. Life in the Day of: A Model. When I think of Bournemouth University, the phrases media and business generally stick in my mind to be the main focus. However, before the media grasped my full attention, my time was often spent being arty and thus the Arts College snuggly nestled next to BU has always intrigued me. I spied a poster on, one of many, message boards and as it seemed to follow me, to the back of the girls’ toilet door, and it read: looking for models. I had done some amateur modelling before – I think it’s mainly the height that jerks the reaction ‘wow you’re tall – you should be a model’. Yet alas I often find myself shying away from such opportunities, either through bad experiences of fake photographers or the general impression being a model gives people. By this I mean the fact that being a model or at least telling people you have modelled, invites them to scrutinise how you look. After all, being a model is all about how you look and so when telling people this, I dislike the awkward situation when you wait for their reaction. However this was much different to any other work I had done before. Previously, I had entertained with TFP’s (Time for Prints) where a model and a photographer takes time out so each of them can gain free shots for their portfolios. Although, now I suppose it should be time for a disk or files – it hasn’t got the same ring to it, has it? With these shoots it was all about how I looked and how I benefit at the end of it. Luckily this was in effect a real job, where I was actually doing this to help these girls as much as myself. It was a relief to change the focus and gave me a brief flash into what my life could have been like if I chose the artistic world to follow – rather than my already busy muddled journalistic radio presenting one. 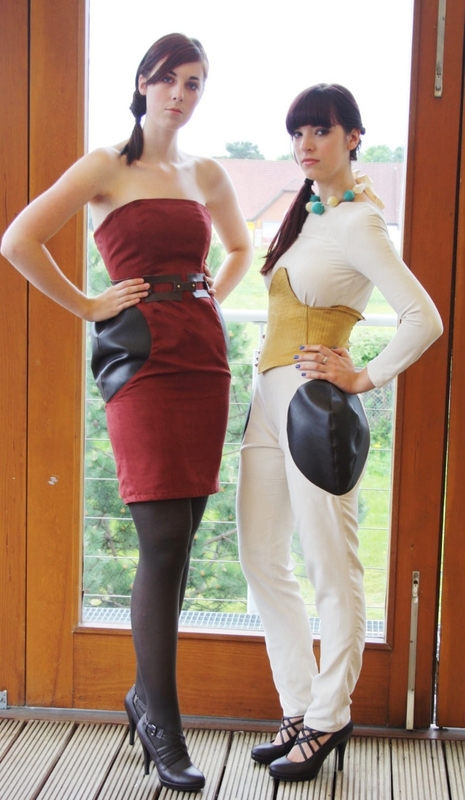 The girls were third year fashion students and preparing their final collection. Their work followed a chain of research and progression as my AS and GSCE art projects did (I do miss them). I had even seen some of this process when helping out in the final few stages with the twirls – that is the practice items of clothing before making them out of the last fabrics. sessions, which by the way felt exactly how I imagine the board room of The Apprentice or Dragons Den would feel, especially when Alan Sugar’s German female equivalent walked in. She was later than the others, so we all stood in silence until Mz Sugar arrived and soundlessly resumed her seat. Like Alan, this woman – whose name I feel best left out for if I feel her wrath – nonchalantly expected the girls to return back to London when the girls had run out of fabric. I was beginning to perhaps regret taking up this role as model after a while, unfortunately due to people letting these third years down I was being used by about four designers as a model for their work, with the burning reminder in the back of my mind that this work should be used for Law and Public Affairs revision. The night before my last session, I have to admit, I was mildly dreading, but the day was a luxury in the end. I was paid to have my make-up professionally done and hair, whilst wearing these lovely last pieces the girls has spent more than 24 hours awake in the end to complete before the deadline. Here are some of the photos to give you a flavour of the day. I’ll upload the studio ones when I have a copy.